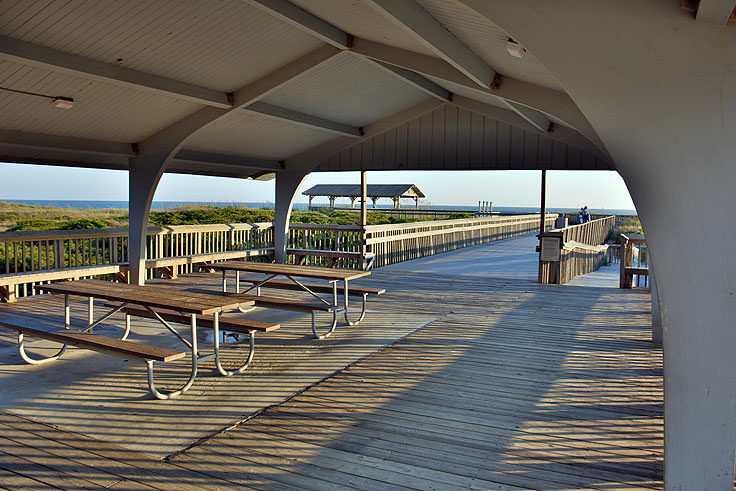 Hitting the seashore in Atlantic Beach is an easy venture, thanks to a number of local public beach accesses, including the sprawling Picnic Street Park. 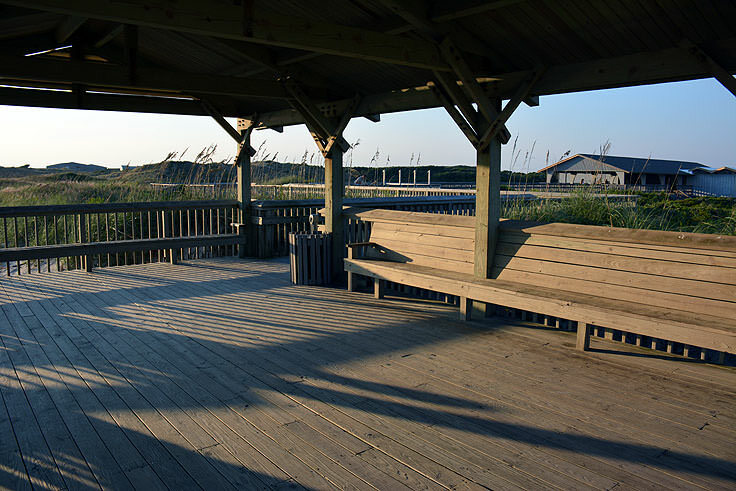 With a prime locale that straddles the borders of the Fort Macon State Park and the town limits of Atlantic Beach, this expansive parking area, known locally as "The Bathhouse," can accommodate hundreds of summer visitors, and provides a perfectly relaxing and undeveloped stretch of seashore that's easy to enjoy on any summer day. 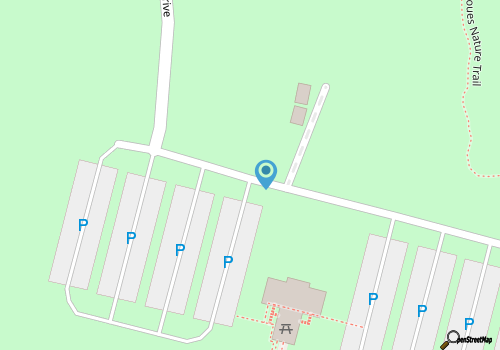 The park, which is more of a fully-accommodating beach access point, is located approximately .1 miles from the entrance to the Fort Macon State Park, off of the appropriately named Picnic Park Drive. 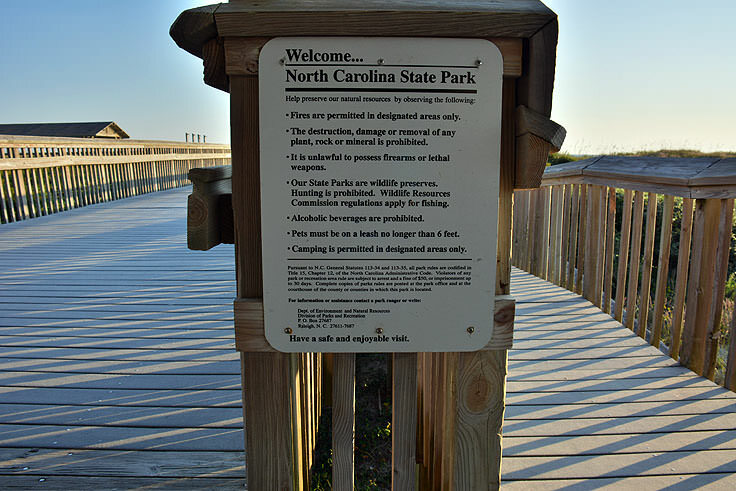 Hard to miss due to the lack of beach houses and businesses in this northern section of the Crystal Coast, the park is an incredibly easy 5 minute drive from virtually any point in Atlantic Beach, and is just a 15-20 minute drive from mainland communities like Morehead City. 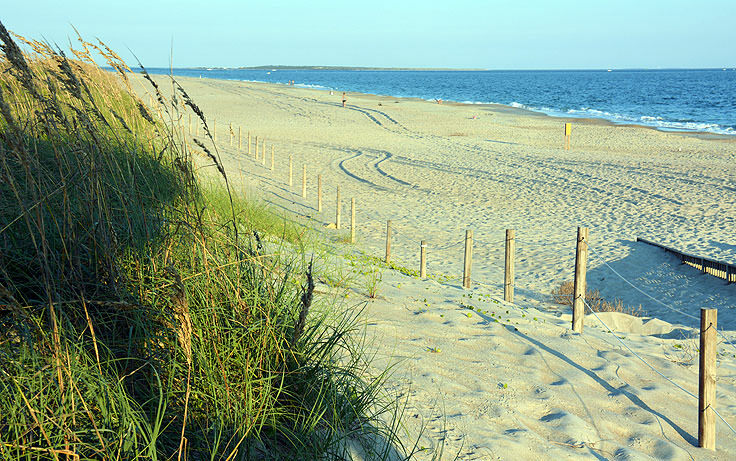 This ensures that the trip to get to the seashore is a so-called "day at the beach" for any visitor, and allows vacationers and locals from all regions of the Crystal Coast's Inner Banks to pack up the sun tan lotion and the beach towels, and be stretched out on the sand within minutes. Because of this easy-to-get-to locale, the parking area is incredibly large, and features two banks of parking spaces, (totaling an impressive 335 spaces), which are located on either side of the main bath house structure. 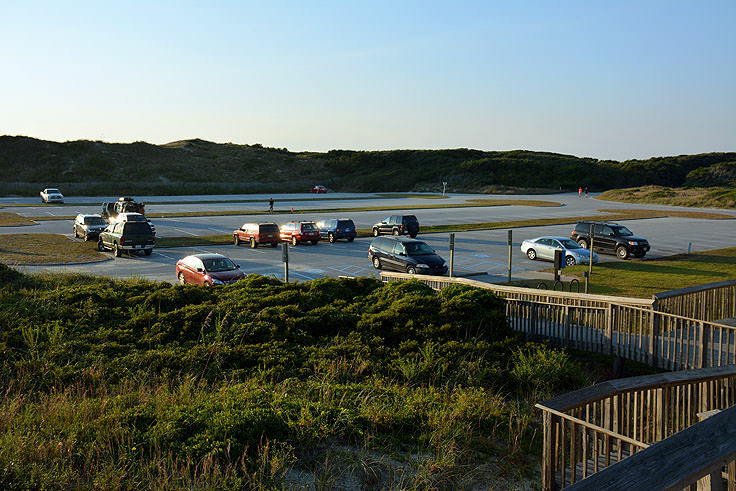 Though rarely completely full, the parking area can be pretty packed on a holiday or summertime weekend, and patrons are encouraged to get there early to ensure a prime parking spot.The evening hours are also a great time to explore the shoreline without the crowds, as the deserted barrier island beaches are quiet, relaxing, and an ideal destination for a romantic and sandy stroll. 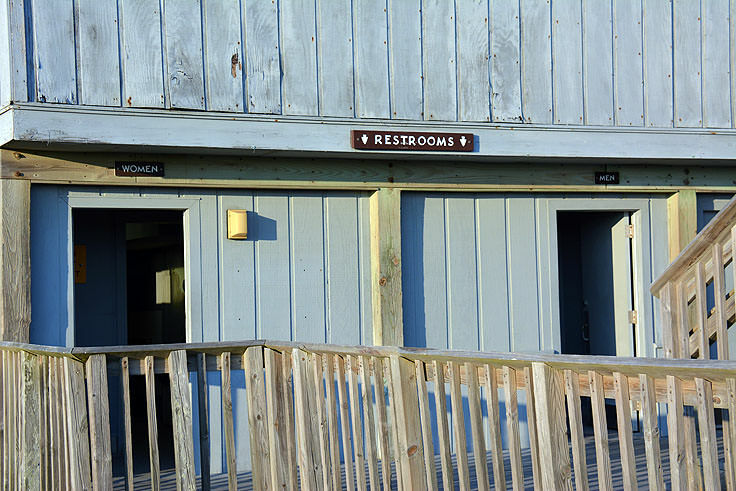 With that being said, it should be noted that the bath house and public parking area both have seasonal hours. From November until February, Picnic Park is open from 8:00 a.m. until 5:30 p.m. In the spring and fall months of March, April, May, September and October, the park is open from 8:00 a.m. until 8:00 p.m., and in the prime summer months of June, July and August, the park stays open from 8:00 a.m. until 9:00 p.m. Essentially, patrons should be prepared to access and use the park facilities during daylight hours only, all year long. 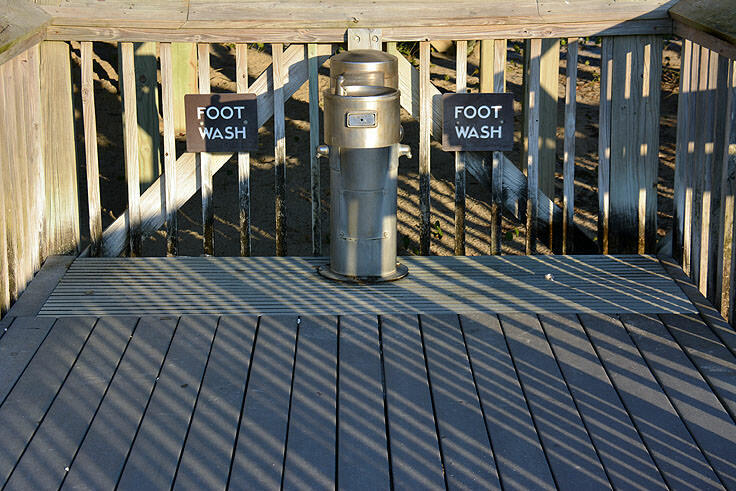 Part of the park's popularity with day trippers is also due to the expansive facilities on site, which include handicapped-accessible showers and bathrooms, a large picnic shelter, and a wooden boardwalk and ramp that extends all the way to the shoreline. 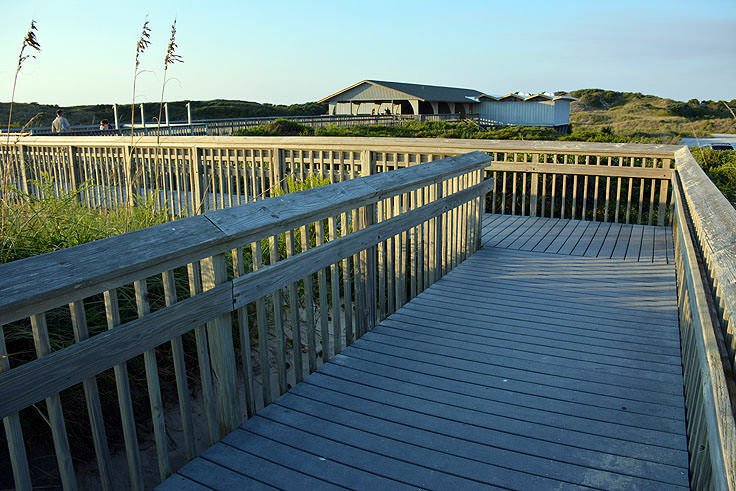 Beach accessible wheel chairs are also available upon request, and can be obtained by calling the Fort Macon State Park before a planned visit at (252) 726-3775. In the summer season, which is generally considered to be between Memorial Day and Labor Day, the park also features concession stands for ice cold drinks and salty snacks to enjoy by the beach. The beach itself is nice and wide, with plenty of room for a slew of beach towels and umbrellas, and a gradually sloping ocean floor that makes wading, splashing, body boarding, and swimming a breeze. In the winter months and early morning and evening hours, the beach is also a good spot for shell hunters, as a number of small treasures, including scallops, coquinas, augers, olive shells, and even the occasional sand dollar, wash up along the shoreline with the tides. A long walk east along the perimeter of the Fort Macon State Park, trolling for these freshly washed-up finds, is a great way to enjoy the beach and avoid the crowds, and is a favorite local activity. 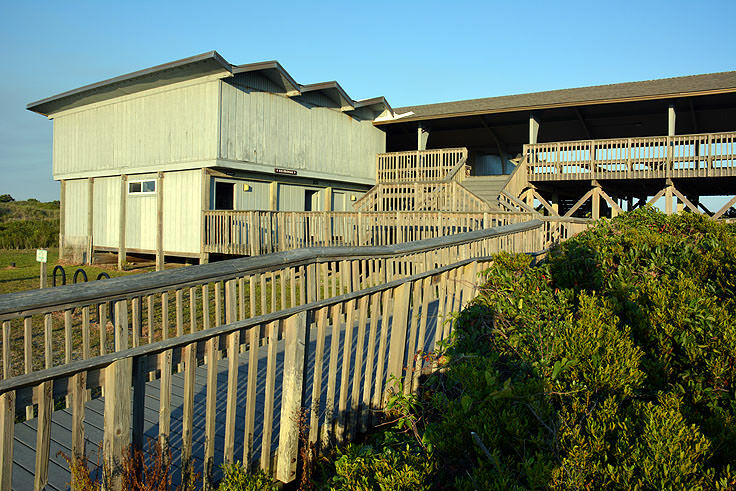 In essence, the Picnic Street Park is a pretty perfect beach destination, with plenty of room for big summertime crowds, as well as the ability to serve as an equally alluring coastal day trip destination during the chillier off-season months. A great public beach access which cements Atlantic Beach's reputation as the premier family coastal destination, Picnic Park is a breezy local attraction that ensures any and all visitors to the Crystal Coast can enjoy a breezy, sun-filled day at the beach.